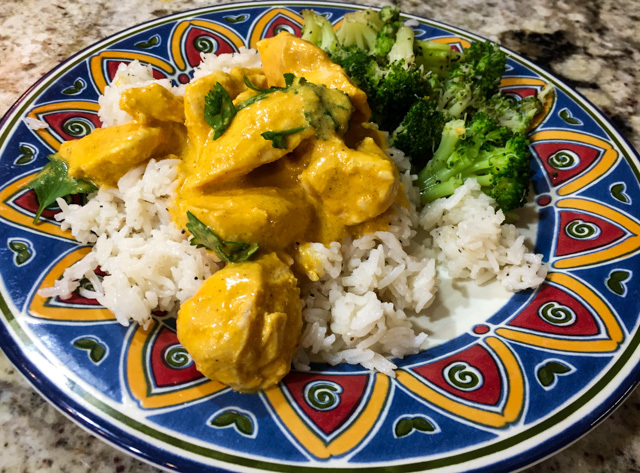 Chicken Korma is a classic Indian recipe, but due to the considerable amount of liberties I took with this classic, I must be upfront about it in the title, to avoid the Food Police coming after me. For starters, I cooked it sous-vide. I know, what was I thinking? But I tell you, the perfect texture is worth it. Perhaps you are familiar with the concept of velveting meat before stir-frying? It is widely used in Chinese cooking and does wonders for chicken breast, pork tenderloin, or shrimp, typical types of protein that will often dry up when submitted to the intense heat of the wok. 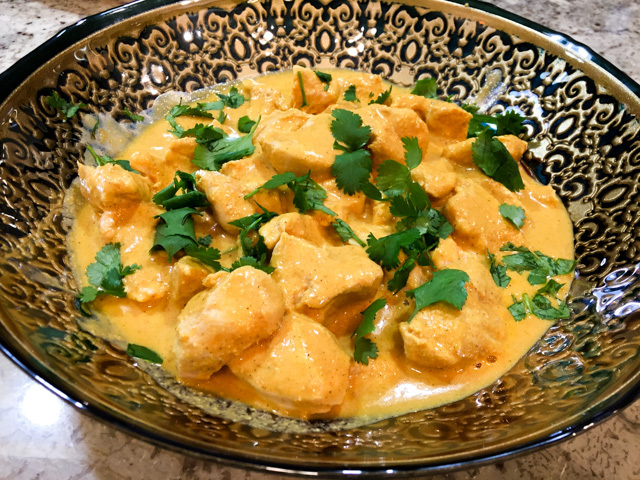 Chicken Korma is not a stir-fry, but the improvement in texture offered by the gentle cooking in the water-bath made me think of velveting. To add insult to injury, I omitted several spices that make Korma a Korma. There you go. Rebel. My middle name. 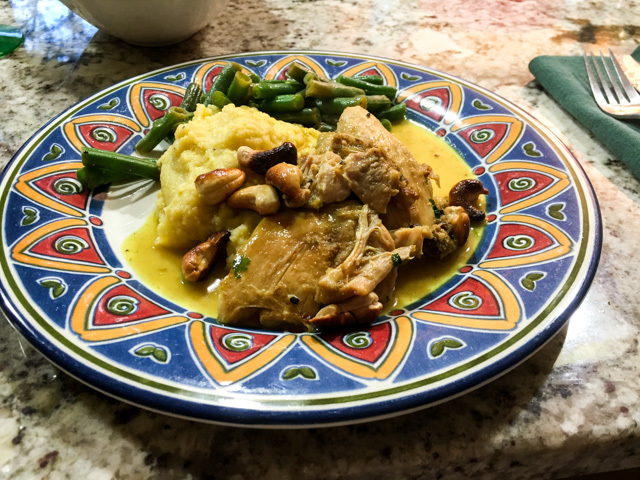 Inspiration came from this recipe at Anova Culinary, a great source for sous-vide cooking. Set the sous-vide to 150°F (65°C). Heat the oil in a large non-stick skillet over medium heat. When the oil is shimmering, add the shallot and cook, stirring frequently, until softened and lightly browned, about 5 minutes. Add the tomato paste, salt, ginger, garam masala, curry powder, cinnamon, turmeric and pepper. Continue to cook, stirring constantly, until aromatic, about 2 minutes. Remove from the heat and let cool for 5 minutes. Transfer the mixture to a food processor or blender. Add the cream, yogurt, cashews, lemon juice, and honey. Process until smooth, about 1 minute. Combine the pureed sauce with the chicken in a large zipper lock bag. Seal the bag using the water immersion technique and place in the water bath. Set the timer for 2 hours to 3 hours. When the timer goes off, remove the bag from the water bath. Transfer the entire contents of the bag to a serving bowl and garnish with cilantro. This recipe was published in Food and Wine magazine back in February 1999. Yes, you read that right, over 16 years ago, when I was only a teenager (in my heart, that is). But someone recently raved so much about it in a cooking forum that other members decided to make it, and next thing I knew, they were raving about it too. I had to join the party and try the recipe myself. However, I modified it a bit, incorporating some tips from our graduate student Aritri (born and raised in India so she knows a thing or two about curries). I also opted by making it in a pressure cooker. No need to run away screaming. If you don’t have one, I’ll share instructions to make it in a regular pan. I am nothing if not accommodating. You are very welcome. 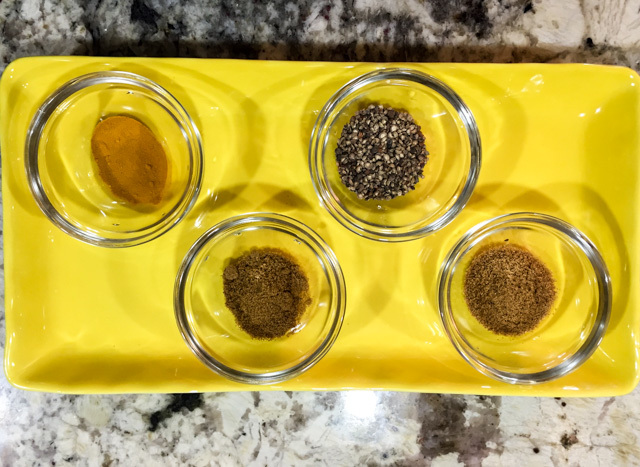 In a bowl, combine the coriander with the cumin, peppercorns, turmeric and 1/4 teaspoon of the salt. Add the chicken and rub with the spices to coat. Cover with plastic wrap and let stand at room temperature for 20 to 30 minutes. Meanwhile, place 1/4 cup of cashews in a small food processor and process, not too fine. Reserve. In a large deep nonstick skillet, heat 1/4 cup of the oil. Add the shallots and saute’ for a few minutes until translucent. Add the chicken, ginger, Serrano chile and the remaining 3/4 teaspoon of salt and cook, stirring occasionally, until the chicken is golden, about 8 minutes. No need to cook through. 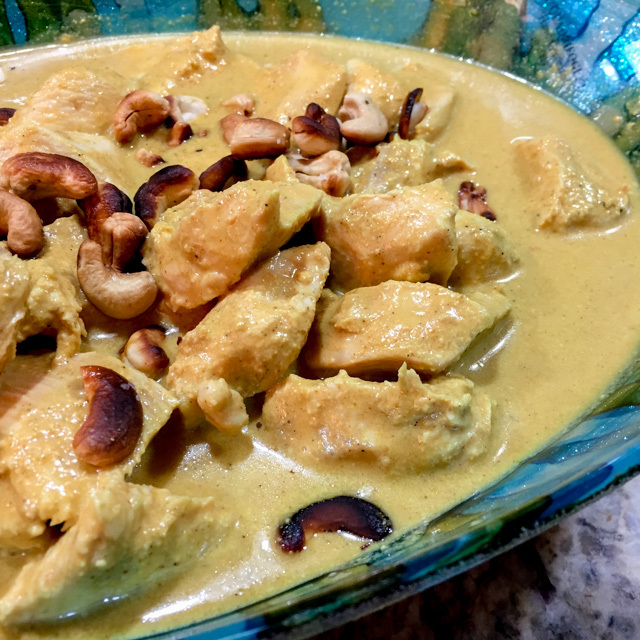 Stir in 1/4 cup of the coconut milk, the water, and the processed cashews, then transfer to a pressure cooker and cook under pressure for 15 minutes. Quickly release the steam (or place the closed pan under running cold water in the sink), and when the pressure equalizes open the pan. If using a normal pan, simply cover the pan and simmer until cooked to your liking (at least 30 minutes). Meanwhile, in a small skillet, heat the remaining 2 tablespoons of oil. Add the remaining 1/4 cup of cashews and cook over moderate heat, stirring constantly, until golden brown. Drain on paper towels. 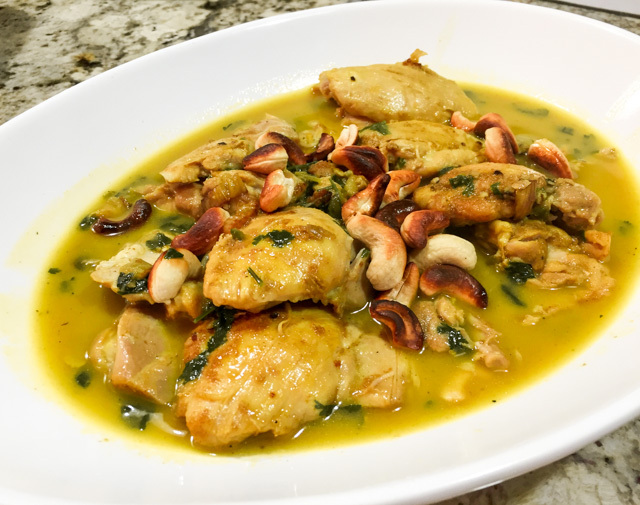 Add the remaining 1/4 cup of coconut milk, the lemon juice and the fresh parsley to the chicken and simmer, stirring. Transfer to a bowl, sprinkle with the cashews; serve immediately. Comments: After so many years of blogging, it’s hard not to repeat statements from previous posts. For those who follow my blog for a while it will be old news that I like to cook chicken thighs longer than most recipes specify. Super tender is what I shoot for. Exactly the same goes for pork ribs. Some people prefer to have a firmer texture in both types of meat, so if you are part of that team, reduce the cooking time. For instance, in a pressure cooker, you could get by with 10 minutes, in a regular pan, 20 minutes (which is what Food and Wine magazine recommends in the original recipe). Pressure cooking is fantastic for recipes such as curries, stews, soups, and chili (made one recently in 20 minutes that was absolutely spectacular). Until a couple of months ago I made the mistake of keeping my pressure cooker in the basement, bringing it to the kitchen only when I needed to make a batch of black beans, or maybe cook some artichokes in a hurry (pressure cooker works wonders on artichokes). Out of sight, out of mind. Not anymore. It is now sitting in our appliance rack and I am always finding ways to use it. It makes life so much easier, many recipes that are not feasible on a weeknight because they would take too long become a breeze to prepare.